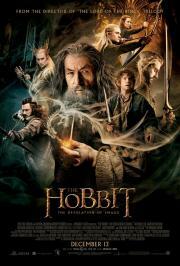 The Hobbit story does not have the grandeur in its bones to carry such long, tedious productions. Making random references to LOTR just does not save it. Also the behaviour of Smaug is just ridiculous; it is like me chatting with 8 cockroaches while chasing and spraying them and then get tricked into electrocution by my own refrigerator by them. Would you watch that movie? Replacing me with a Dragon doesn't make THAT much of a difference, although the movements of the dragon are really fluent.